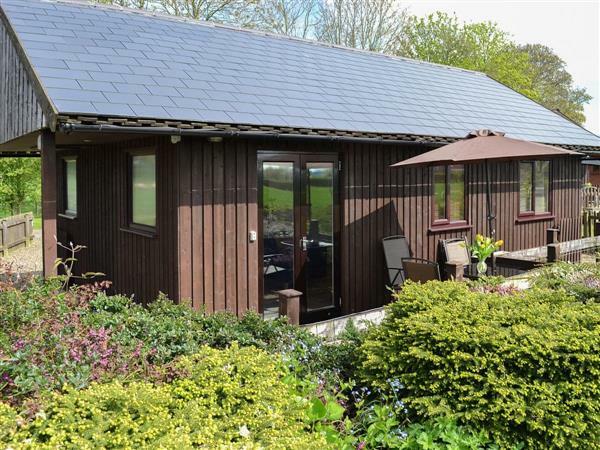 With wonderful views and offering peace and relaxation, one of a select group of just 5, this single storey, detached holiday lodge has been tastefully furnished to a very good standard, in a contemporary style. Ideal for holidays all year round. The holiday property lies midway between Helmsley and Kirkbymoorside, on the edge of the North York Moors National Park, which makes an ideal location for touring by car or by bike (storage available), or simply walking from the door in the lovely countryside. Pickering is the home to the NYM Steam Railway, whilst Helmsley has a good range of specialist shops and a choice of inns and restaurants. Castle Howard, Duncombe Park, the city of York and the coastal resorts of Scarborough and Whitby all make excellent days out. Shop 3 miles, pub and restaurant 0.5 miles. Elec central heating, electric, bed linen and towels included. DVD and small library. Stereo/CD. Electric cooker. Microwave. Washing machine. Dish washer. Decking and furniture. Portable Barbeque. Parking (2 cars). No smoking please. Holidays at Ash Lodge run from Saturday to Saturday. For a better idea of where Ash Lodge is, you can see Ash Lodge on the map below. Ash Lodge is in North Yorkshire; should you be on the lookout for a special offer, you can find all the special offers in North Yorkshire. It's always worth checking to see what is on offer at the moment. Do you want to holiday near Ash Lodge (W40993), you can see other cottages within 25 miles of Ash Lodge; have a look to find your perfect holiday location.